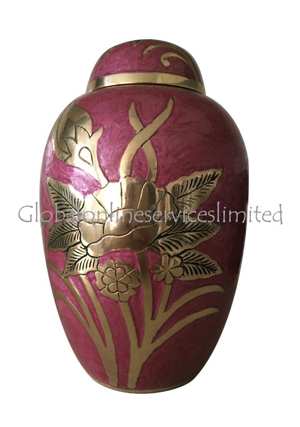 The Dome Top Embossed Adult Urn has a beautiful funerary style, combining a dusky pink enamel with polished brass engraving. 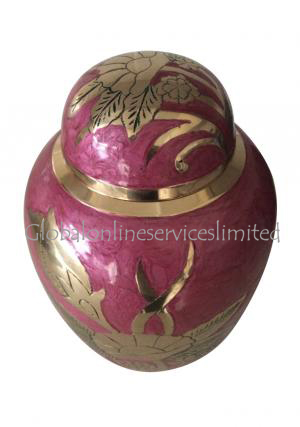 The urn is hand cast from the finest quality brass, and the floral design has been picked out on the domed lid as well as the body of the pot. 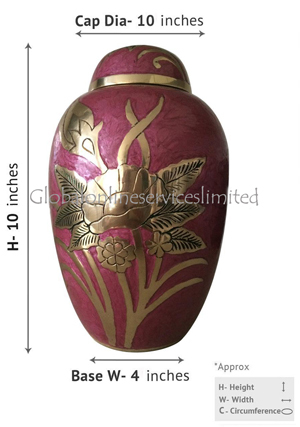 The Dome Top Embossed Urn weight approximately 2.34 kg unfilled, and is designed to take the full ashes of an adult. It is 10" height. 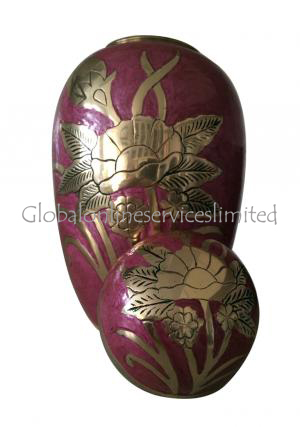 Its lack of religious symbols makes it ideal for use in secular as well as traditional or religious memorial settings. The Dome Top Embose Urn is delivered completely free of charge to any address within the mainland UK. Delivery takes between 2-5 business days, when an order is made before 3pm on a prior working day. For delivery times and prices to addresses outside of the UK, please contact our friendly and helpful customer services team on cs@cremationurnsashes.com; or phone us on 020 8004 6667. All of our adult urns may be personalised to reflect the true nature of your loved one; made to order from your specifications. To request either a personalised finish, or a made to order urn, please contact us using the details listed above. 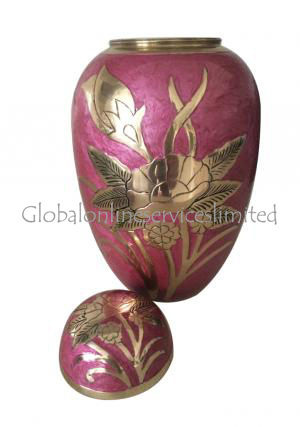 Our customer services team will be delighted to help you choose the right elements for your urn. All of our staff members are discreet, friendly and respectful. Payment may be made securely either over the phone or through our secure online payment portal.